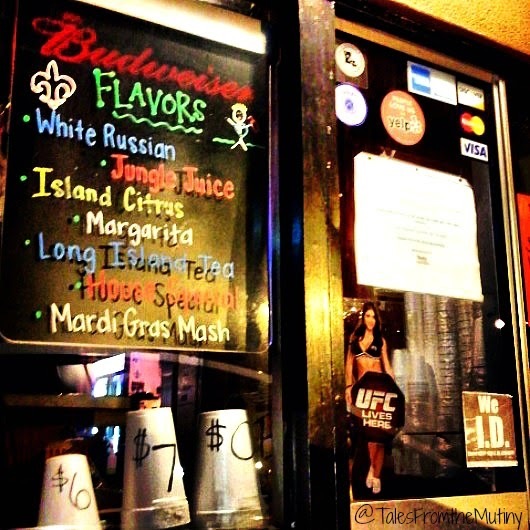 The Mutiny is no stranger to New Orleans. 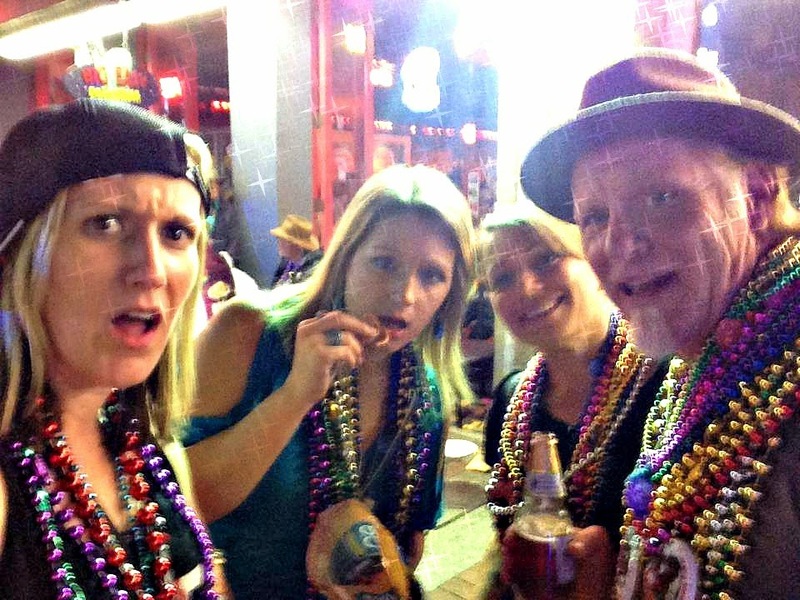 During our first year on the road we spent a week in the French Quarter and did it up tourist style…beignets, Sazeracs, French 75s, ghost tours all mixed with a side of local flavor provided by friends who actually live in NOLA and could give us “the scoop”. 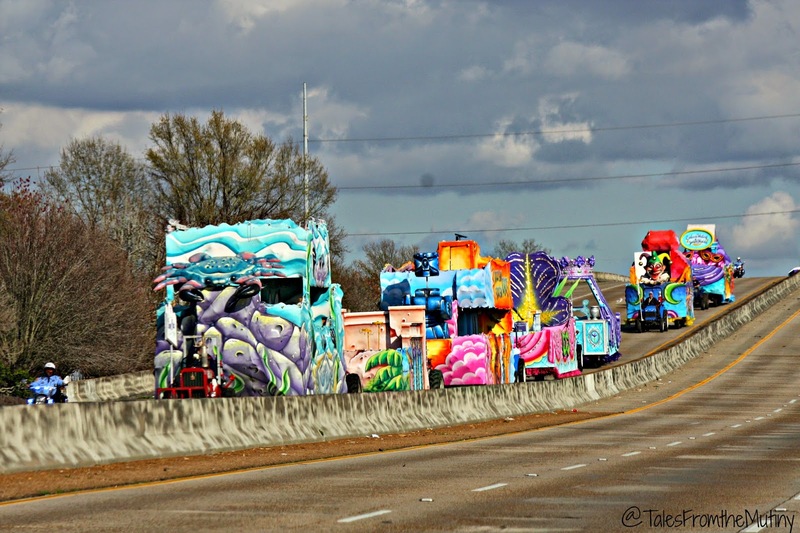 So, our return trip in March of 2014 was strictly for experiencing Mardi Gras (and not so much hitting up all of the same touristy spots). And here’s where we got lucky. 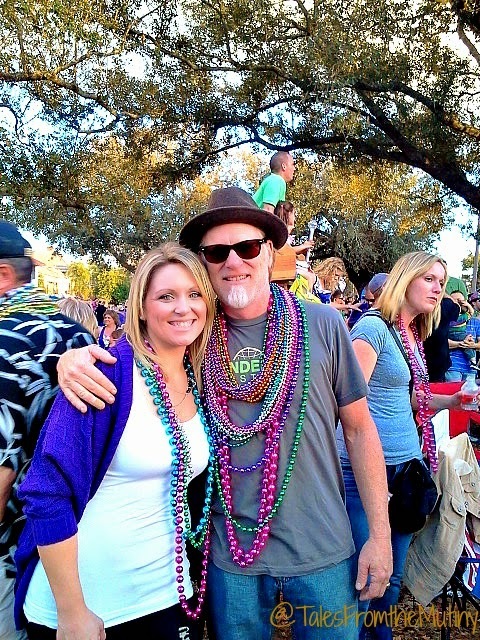 Our daughter-in-law, Ashley, was born and raised in New Orleans. She and Gina, Clark’s daughter. 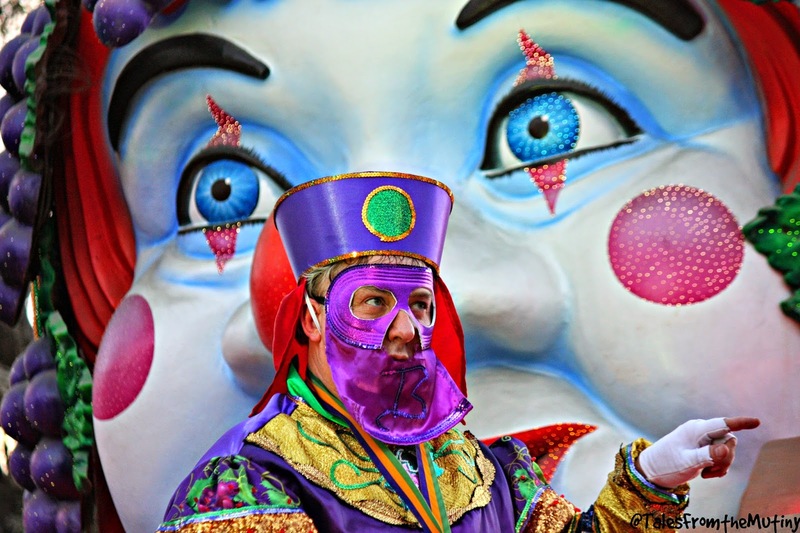 return every year to celebrate Mardi Gras. 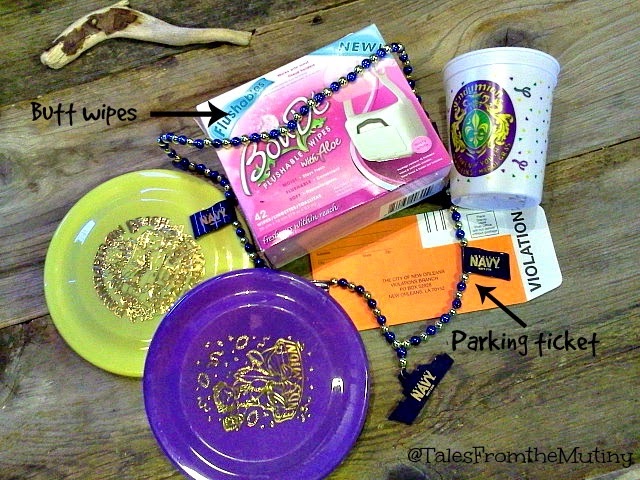 Not only did we have the best reason ever to make NOLA a destination, but we literally had the “in” for the festivities! I had no idea how things worked for this major undertaking…I didn’t know what a krewe was and therefore had no idea which parades we should be going to or even how to get there once the streets started to shut down…but Gina and Ashley are experts and guided us through the choas. Because we were meeting with Gina and Ashley we spent our first week in Picayune, Mississippi at Sun Roamers RV Resort. It’s a really nice campground with all of the amenities one would like at a resort that charges $33-$37 per night. They have a friendly staff and the grounds are well maintained but, unless you too have family in the area, there isn’t much to do in Picayune. 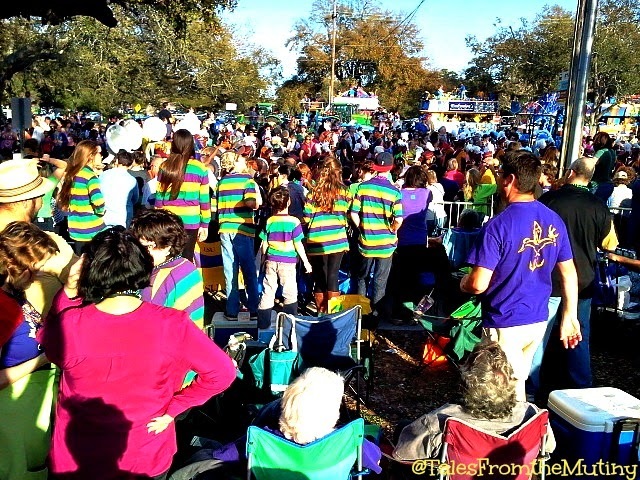 And it’s still at least 45 minutes from New Orleans.It definitely served our purpose to be near the girls and their friends for our pre-parade festivities…and there was another fulltimer who had a monkey…wearing clothes…so yeah, there’s that for perks. 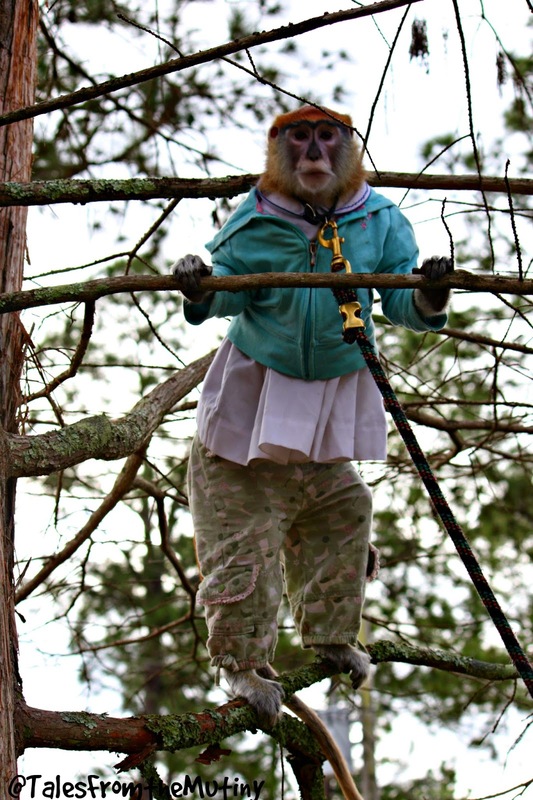 Our neighbors “service monkey”…she was cute until she scratched me while knocking the camera out of my hand. 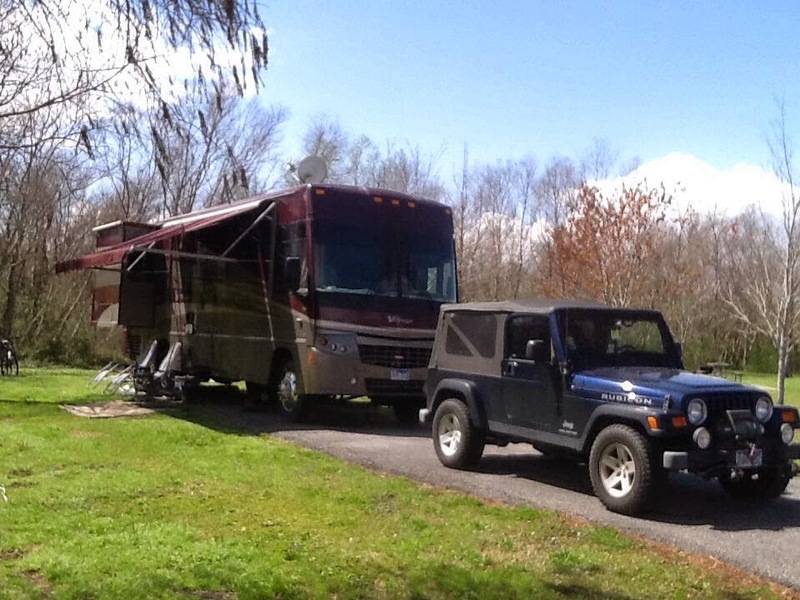 The last time we were in New Orleans we splurged by staying in the city…the French Quarter RV Resort to be exact. It was wonderful, albeit expensive, but within walking distance of the Quarter. But, they really jack up the prices during Mardi Gras and a spot will set you back $199 per day. This trip we went the thrifty route and we were not disappointed one bit. The sites at Bayou Signette are large and grassy, lots of room to spread out and host gathering or let the dogs (or cats) sniff around. There are also some hiking trails, biking opportunities and even a water park. 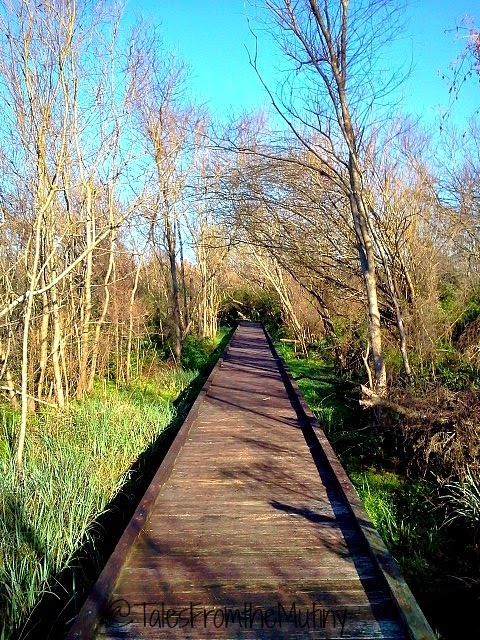 One of the walking decks in the park. We stayed at Bayou Signette State Park in Westwego which is just across the water from the French Quarter. At just $25 per night (water and electric with onsite dump station and free laundry) it was a real bargain. It’s an easy drive to New Orleans and there’s even a ferry you can take directly to the French Quarter. But we had our own tour guides (Gina and Ashley) and enjoyed being chauffeured to most of the events around town. The other cool part was that our friends the Snomads (Jason and Kristin) were camped practically across from us and so were Meagan and Jesse. We also met up with Live, Breathe, Move (Jeremy and Robin) who came down for the day to watch parades and visit friends. 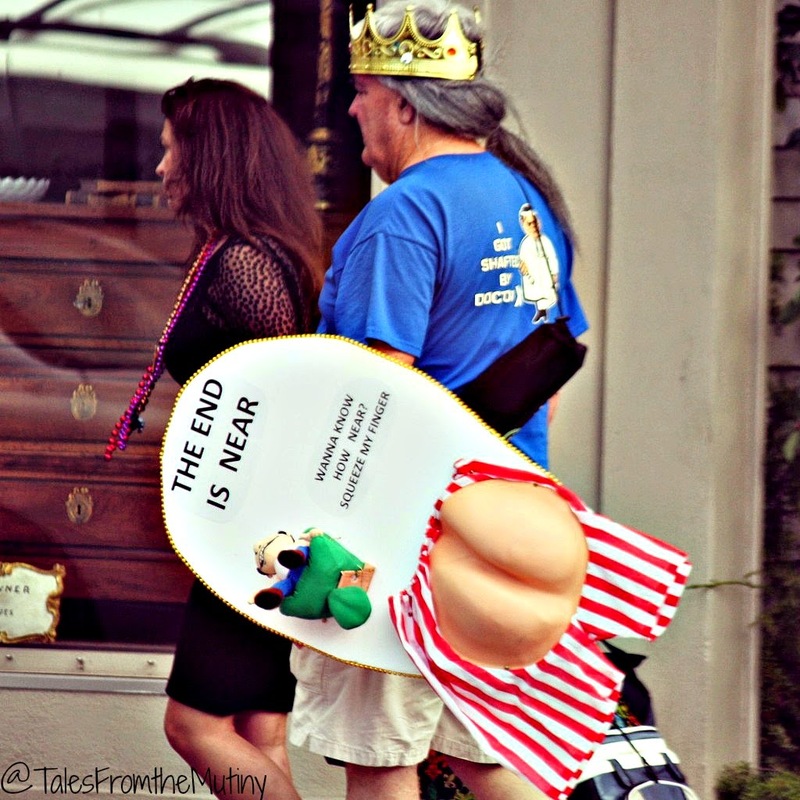 Since we didn’t do much outside of attending Mardi Gras parades I’ll let the photos tell the rest of the story. Drive-thru margaritas is a real thing. Of course, they leave the top of the straw wrapper intact so you aren’t even tempted to drink and drive. 2) Find proper parking: This can be tricky but it’s important. We thought we were pretty smart when we spotted a bunch of people parking along some old, unused railroad tracks (we have a 4×4 after all). We thought, the cops are far too busy monitoring the parade route that they surely won’t be concerned with giving out parking tickets. We thought wrong. 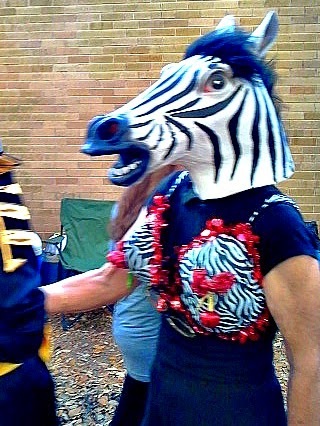 It’s amazing the things you can catch (other than beads) during the parades. What’s not amazing is getting a parking ticket. 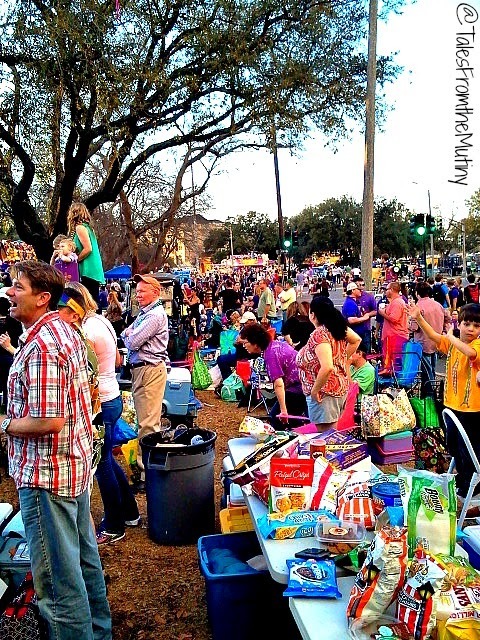 3) Scout out (and save) your spot: The neighborhoods are, by far, the best place to enjoy the parades. There’s an unspoken rule that when someone puts their chairs out (often weeks before the first of the parades) that you don’t mess with them. Ladders, complete with sitting boxes for the kids and wheels for easy transport, are the preferred viewing devices. Get there early for the best spots. Note: “Early” means two weeks prior to the first parade for most locals. Although you need to be prepared for crowds remember, every one is in a good mood and generally very friendly so maneuvering through the crowds to find your people isn’t too scary. 4) Bring food and drinks (including water, trust me): We were fortunate to have Gina and Ashley’s friends feel sorry for us take us under their wing and provide a wide assortment of traditional Mardi Gras tailgating foods (cupcakes, chips, sandwiches, cakes, beer, wine, water, mixers, etc). 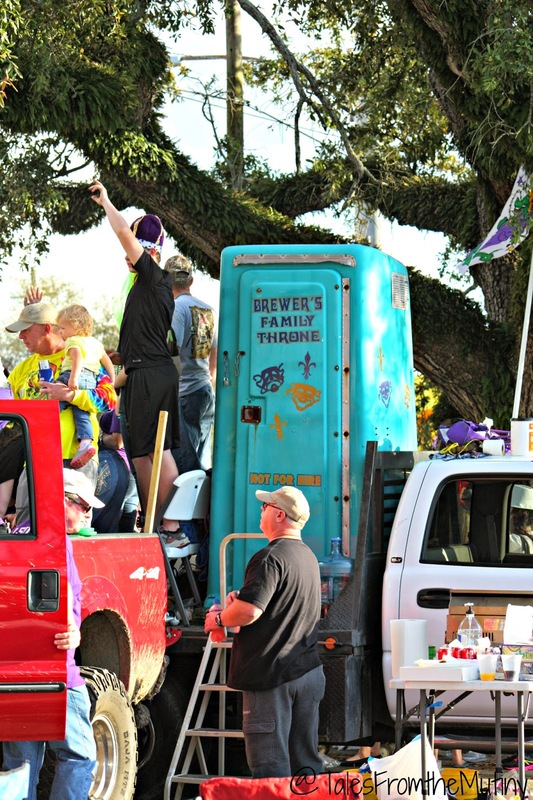 5) If you can, bring your own toilet: While the city does a good job posting port-o-potties along the parade route lines can be long. And when you combine drinking all day with not enough potties it can be a recipe for disaster. At first I thought this was hilarious (and maybe ridiculous) and then I realized it was genius. 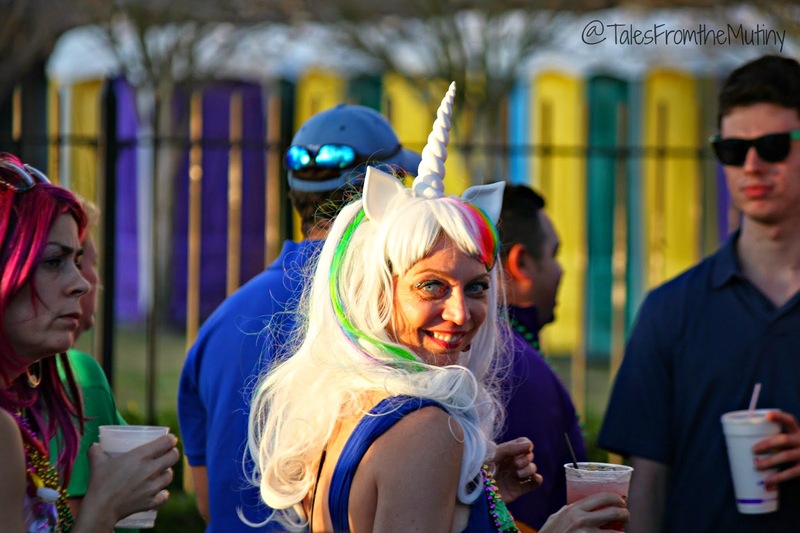 6) Bring your family (including the kids) or some friends: Even though we still love each others company, I feel Mardi Gras is especially fun when you have a group of people to share it with. Surprisingly, it’s also very family friendly. Most parades start during the daytime in the neighborhoods rather than downtown near the bars. Kids seem to get a lot of the “good stuff” too, from hula hoops to stuffed animals, so stand near a kid and you might get lucky too. Out late with the “kids”. 8) Go with the flow and have fun! It’s probably not every day you party down with wild abandon getting beads thrown at you (if it is keep doing what you’re doing!!) so let yourself enjoy the spectacle. Grab a map, get the parade schedule online, grab some friends, wear a boa or a tiara or a zebra head…and enjoy. If the parades overwhelm you there are still plenty of other things to do in the city and plenty of great food to sample. Check out our blog from our first visit for some ideas. We threw together a little photo montage with pictures not included above (but they’re worth looking at) so if you can spare the bandwidth check it out. It’s only about 55 seconds long. And let us know what you think in the comments (it’s our first attempt!!). And for those of you with unlimited bandwidth (lucky bastards….kidding!!) Ace&G (that’s Ashley and Gina) have been vlogging every.single.day for the past 3 years and they have some great footage of this Mardi Gras. Check it out here… (adult language ahead). We love comments and love to answer your questions. Leave ’em in the comments of ask on our Facebook page.